Happy February MAIAM readers! It’s that time of year when we’re inundated with tokens of love. Personally, I don’t celebrate Valentine’s Day, but it’s nice to have something to break-up the monotony between the end of the winter holiday season and the start of the spring holiday season. You know what else breaks up the day-to-day? Getting into a great book series. 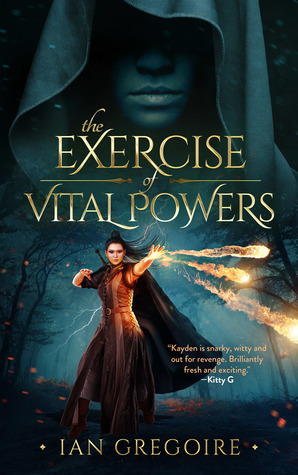 My current novel is called The Exercise Of Vital Powers. It’s a cautionary tale of a precocious anti-heroine possessing great magical abilities who must learn the dangers and consequences of abusing power. I like the title, The Villains Of The Peace, but I won’t ever use it because readers might be put off by what they see as a spelling mistake rather than a play on words. Words are kind of our thing. What’s your favourite word? I can’t single out any single word as a favourite, but for the purpose of answering the question, I offer discombobulate. The first time I ever heard it I couldn’t believe it was a real word. I think there are better synonyms available, so it’s a word I’ll never use in my own writing. I find it much easier to concentrate on my writing in the mornings because there are less distractions to hinder me, so that’s when I do most of my writing. Having said that, if I’m really in the mood and on a roll with a story, I can be productive in the early evenings, too. Even if the settings for my stories are fictional they are still inspired by real world places, so my naming conventions will be derived from those of whichever geographical location I’ve chosen. I just smile and feel good about myself for a while. We’ll see what happens when I finish my current manuscript. Peace of mind. Once I’m fully immersed in my story and characters I’m able to forget about all my worries, albeit temporarily. Definitely Lois McMaster Bujold. Obviously she’s one of the most critically acclaimed speculative fiction authors ever, but more important than that, I’m really envious of the quality of her prose, and she writes the kind of character-driven tales that I want to emulate with my own work. I never gave it much thought until now, but do I get through quite a few notebooks during the course of a year. I can’t think of anything specific, but living in a concrete jungle like London, I can’t help but appreciate the beauty of flowering tress on those infrequent occasions I come across any. I particularly like the sight of cherry blossom, crab apple, and magnolia trees. I’m starting to become a big fan of Grace Draven’s writing so I expect I’ll be reading a few of her books this year. I also need to catch up on my Sarah Doughty and Lindsay Buroker reading. In terms of indie authors I haven’t read yet, but intend to do so soon: I.L Cruz (YAY! ), Claudia Silva, K.S. Villoso, Patty Jansen, and Aubrey Law. There are several others, too, but they are further down the pecking order so I probably won’t get to them this year. Thanks for taking the time to join the growing MAIAM family! Good luck with book two, The Apprentice in the Master’s Shadow (great title, BTW) and I hope we can see you hear again! It was great “having” you on. Good luck with your WIP…I think we’re all in the same boat on that one.